On this date, January 3, A.D. 1521, Pope Leo X excommunicated Martin Luther and his followers. Leo published Decet Romanum Pontificem ("It befits the Roman Pontiff"). By it Leo effected the excommunication threatened in his earlier document of the previous year, Exsurge Domine ("Arise O Lord!") in which Leo called upon the Lord, St. Peter, St. Paul, and all the church to rise up against the "wild boar" of Psalm 80:13 said to be trampling upon "the vine" mentioned in the same Psalm, v. 8. 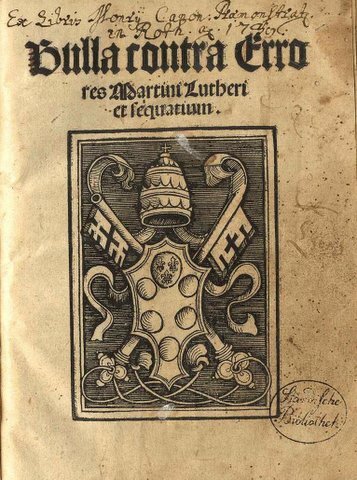 Leo promulgated Exsurge Domine as a response to Martin's publication of his 95 theses on the power of indulgences, on October 31st, 1517. This year we commemorate the 500th anniversary of the Great Reformation of the church. Next week CRTS will commemorate this work of the Lord and we will celebrate it many times, especially as we approach October 31st. But it is good already to remember the Reformation today, the anniversary of our excommunication from the false church.